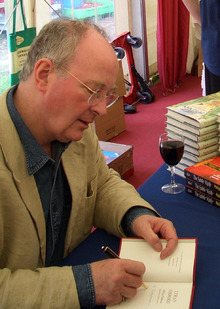 Philip Pullman was born in Norwich on 19th October 1946. He is the acclaimed author of the His Dark Materials trilogy: Northern Lights, The Subtle Knife, and The Amber Spyglass. His other books for children and young adults include Count Karlstein and a trilogy of Victorian thrillers featuring Sally Lockhart. Northern Lights, the first of Pullman's His Dark Materials triology, won the Carnegie Medal and the Guardian Fiction Prize. The following is a personality profile of Philip Pullman based on his work. Philip Pullman is boisterous and social. He is intermittent, he has a hard time sticking with difficult tasks for a long period of time. He is unconcerned with art as well: he is less concerned with artistic or creative activities than most people who participated in our surveys. But, Philip Pullman is also laid-back: he appreciates a relaxed pace in life.